This page comes to you from the fine Jaguar Eco Lodge at Km 105 on the so-called Transpantaneira...But first what of K-Nine's turbo I hear you all ask! 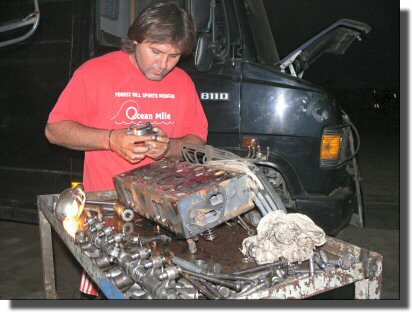 From the information Clive was given in Paraguay, it seemed that it would be very improbable that a replacement turbo for K-Nine would be available anywhere in South America. Because of this Clive was persuaded to have his turbo repaired (again!) in Asunción by Condor (the official Mercedes agent). As a backup Clive also arranged for Mercedes in the UK to get him a replacement turbo ready to ship to Brazil. The repaired turbo lasted only 1400km! On Sunday night, with K-Nine's turbo squealing ominously, Clive sent an e-mail to Mercedes in the UK asking them to ship him a new turbo to Cuiaba where he intended to wait for it to arrive whilst the rest of the group explored the northern Pantanal. On Monday the group crawled into Cuiaba with K-Nine's turbo (and Ann) in considerable pain. On the way to the hotel parking that Kolob had found for us, we searched for a suitable place for Mick and Mo to buy a tyre to replace the one of theirs that had been shredded earlier. The Michelin tyre supplier we found was Cuiaba Diesel, who are also the local Mercedes agent. Whilst Mel's tyre was being replaced, Clive asked Cuiaba Diesel if they, by any chance, had a turbo for a European model 1994 811D Mercedes Van in stock. Rather surprisingly they said yes! Very luckily, because Monday was a holiday in the UK, Clive was able to stop Mercedes (in the UK) from shipping him a second turbo (they cost around $1000USA so you don't want too many!). Tried to repair the turbo with inappropriate parts from a different type of turbo resulting in a misalignment of the oil feed and return pipes. Bent the oil return pipe so as to restrict (or possibly stop) oil flow thru the turbo. Failed to fit appropriate copper washers on the fuel return pipes from the injectors. As a result, excess diesel was running into the sump (and diluting the engine oil) rather than being returned to the fuel tank. When the failed turbo was examined, there was found to be massive "play" in the bearings. Whether this was due to faulty parts or the result of the restricted oil flow thru the turbo is hard to say. In summary, the Condor Mercedes garages in Asunción and Encarnacion had converted a running K-Nine, with a small oil leak, into a mechanical disaster. Two turbo "repairs" were required, then a new turbo, two injector "cleanings" and then four new injectors with the cylinder head removed twice! No satisfactory explanation has been forthcoming as to why Condor in Asunción thought the turbo, on the left centre of the engine, was the cause of an oil leak at the front right of the engine. No satisfactory explanation of why Condor in Encarnacion thought the injectors needed cleaning, charged for cleaning them, but failed to clean them, has been forthcoming. Nor has any explanation of why Condor in Encarnacion thought the valves need adjusting been provided. So if you find yourself in Paraguay with an overland Mercedes vehicle that needs attention, you might be best to go to Brazil or Bolivia! Since Cuiaba Diesel (S15.634068 W56.047028) replaced the turbo, fitted the correct washers on the injectors and changed the oil, K-Nine has been running satisfactorily. So back to the Transpantaneira. This road was originally intended to run (north - south) right thru the Pantanal, but a mixture of financial and ecological reasons resulted in it being abandoned at Porto Jofre after only 146km (and nearly 200 wooden bridges). 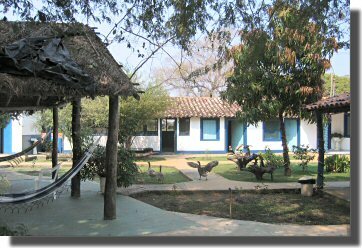 Our first stop (with all four vehicles) was at Pousada Rio Clarinho (Km 40 S16.600175 W56.729882) where we camped and ate dinner for around $13USA per person. The place had a great rustic atmosphere and we were made to feel very welcome. Recommended. Although some of the bridges up to Km 40 were a little rickety, even Kolob (at about 13,000kg) was able to cross them. In addition to the animals some of us had seen in the south of the Pantanal, we also saw Capuchin monkeys, otters and a snake. The road to our second overnight stop (the Jaguar Eco Lodge at Km 105) has a maximum weight limit of 8000kg. 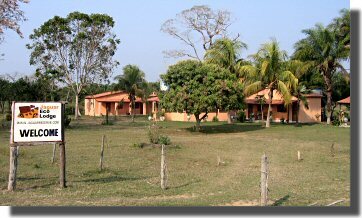 So Kolob wisely decided to remain at Pousada Rio Clarinho . 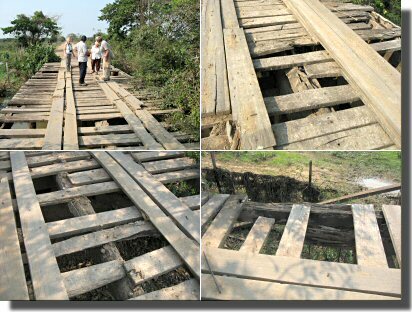 Several of the approximately 80 bridges we had to cross gave considerable cause for concern! As we approached the lodge, K-Nine was shocked to see a large black cat with a round head and short ears cross the road in front of them. Having talked to the guide at the lodge and studied some of the Pantanal wildlife books, the animal was identified as a juvenile jaguar! Alas only Ann and Clive saw it. Today we were intending to drive on to the end of the Transpantaneira. However we were told by the guide at the lodge that one of the bridges (in about 9km) had been "destroyed" by a truck during the night. We decided that, in spite of this, we would go and have a look. After about 6km we came to a bridge that, whilst not "destroyed", none of us wanted to cross. So we returned to the Jaguar Eco Lodge for a days's relaxation (i.e. running repairs) and a guided night drive in search of jaguars etc.